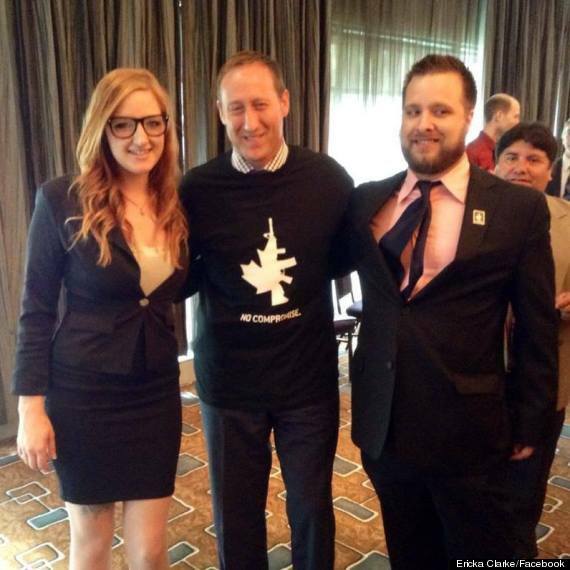 A photo of Canada’s Attorney General and Justice Minister, Peter MacKay, recently went viral on social media. The government’s top legal bureaucrat was seen posing with Canada’s National Firearms Association, sporting a t-shirt in support of the group’s endeavours. The graphic on this gifted apparel melded the country’s maple leaf symbol with a rifle, and everyone in the shot was smiling. Going by the acronym “NFA”, it is the northern counterpart to America’s NRA, that holds considerable influence over gun control laws on the stateside. The NFA was identified by mainstream news as a social force behind repeal of the Long Gun Registry. The Quebec government was also mentioned for a temporary injunction to halt that repeal, with its case to be heard by the Supreme Court of Canada. Despite this acknowledgement, the most important information that raises questions about of conflict of interest appears to be overlooked or censored. 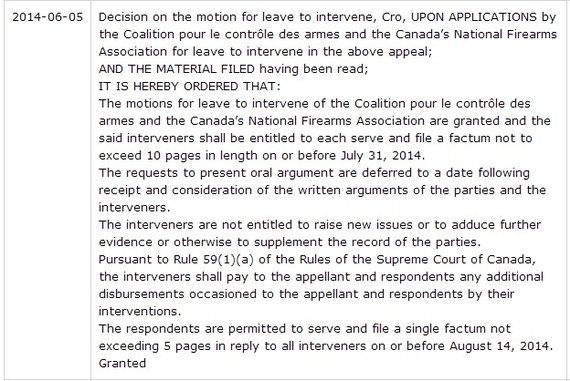 On Docket 35448, Attorney General of Quebec v. Attorney General of Canada, et al, the NFA is listed as a party to the proceeding, that will argue constitutional matters in relation to gun control. Quebec wishes to keep a registry and the federal government is strongly opposed, with the NFA in its corner. 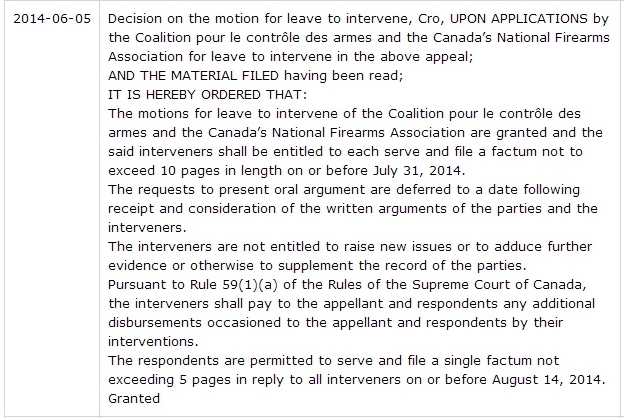 On June 5, 2014, Canada’s National Firearms Association received Intervener status from the Supreme Court. It came with instructions to pay the Attorney Generals (Canada and/or Quebec) any monies required to cover the cost of additional disbursements that may arise from the gun lobby’s participation in the hearing. The NFA is forbidden from introducing new evidence, or supplementing the appellant and respondents’ records. On July 31, 2014, the NFA filed its documents including a Factum and Book of Authorities. On August 14, 2014, MacKay’s office did the same and the following day the case to suspend Quebec’s gun registry was set to proceed with appeal. It was less than two weeks later that the infamous picture was discovered, indicating a personal-political relationship between NFA members and Canada’s Attorney General. Given the longstanding ruckus between Peter MacKay, the Prime Minister’s Office and the Supreme Court of Canada, the public has little patience for the appearance of impropriety. Going forward it will be important to learn if or what gifts might have changed hands between these judicial parties, and the appropriateness of campaigning for one another while legally opposing a provincial government. More to the unsavoury appearance, the Twitterverse discovered additional photos of NFA members who posed with the Attorney General. On veteran Kurtis Gaucher’s Facebook page, he’s found casually bragging about 4 ounces of marijuana. 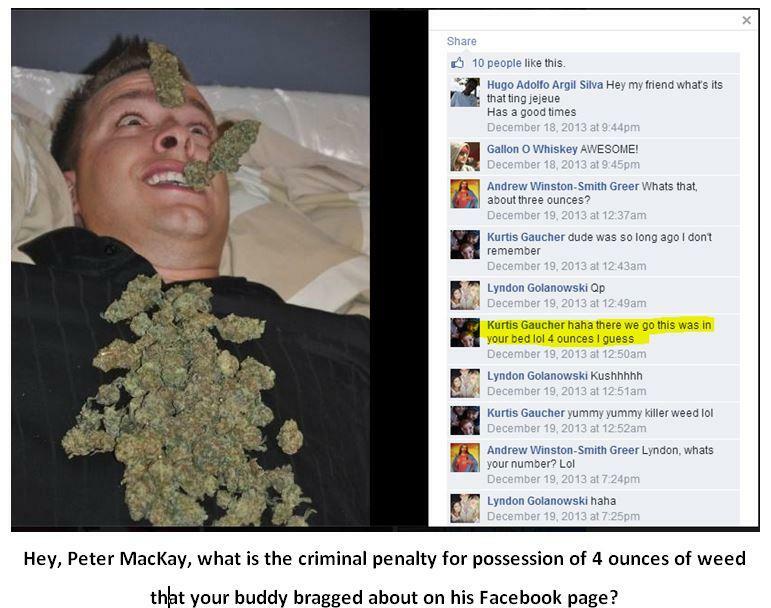 Perhaps Gaucher has a medical prescription, but in light of MacKay’s vehement stance against the substance, it sparked renewed publicity across social media. On Ericka Clarke’s Facebook account, a photo of the woman holding a significant weapon was discovered. Her social media has since been closed to public access and the option to contact was removed. Before this occurred, a Twitter member took the liberty of pointing out the irony with a Buddies, Bullets & Bongs meme that is quickly gaining traction. In the meantime this relationship is clouding another Supreme Court case regarding constitutional rights within the provinces. The Attorney General of Canada appears to support ‘gun toting drug slingers’ over public safety, according to the consensus of popular social media. With a little less tongue-in-cheek, the Supreme Court may need to ask if the fees it assessed were paid to the government in promotional t-shirts, however.